In the latest issue of Columns, I visit with wives of local architects who provided support to their husbands’ careers and to each other through participation in the Dallas Architects’ Wives Club. Learn more about the untold history of the group and hear more memories from its past members here. 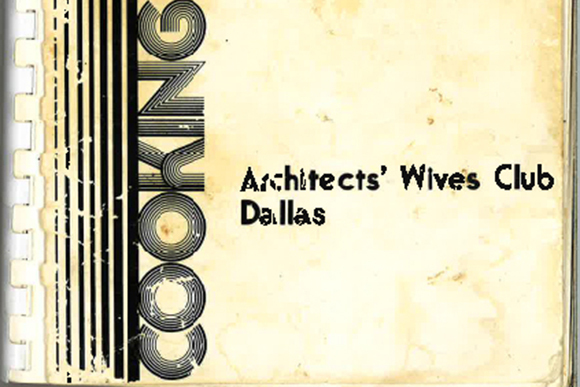 The Architects’ Wives Club published Cooking Directions in 1976 for the Texas Society of Architects convention in Dallas and republished it in 1978 for the national convention. It was that quote in the cookbook that led me to meet these women. One of my co-workers pointed out the blurb in an AIA document about the Architects’ Wives Club cookbook, and I was curious enough to try to find a copy of the cookbook. I got in touch with Connie Hawes and Pat Meyer, who lent me a copy of the cookbook and suggested that the best way to learn about the Architects’ Wives Club was to meet the group. They were absolutely correct, and I am very grateful they organized the reunion. The favorite recipes, Connie and Pat say, are Angel Biscuits, Marinated Carrots, Mexican Enchilada Casserole and Ward’s Beans. Although Cooking Directions is no longer in print, we’ve included some favorite recipes below and the full cookbook can be downloaded here. Sift together first 5 ingredients. Cut in shortening. Add buttermilk and yeast mixture (dry yeast dissolved in the warm water.) Mix and place on well-floured board. Flour your hands, knead the dough for about a minute. Roll out and cut. Dip in melted butter, fold over, place on greased baking sheets. Bake in 400F oven for about 15 minutes. Biscuits may be frozen before cooking by placing prepared biscuits close together on baking sheet, freezing solid, then placed in a plastic bag or container. Frozen biscuits may be placed directly on greased baking sheets, adding about 5 minutes to baking time. Dough may be kept in the refrigerator for several days also. Wash beans and place in earthenware pot large enough to hold beans when swelled, but not over 6 qts. Barely cover beans with cold water. Place on very low flame and bring to boil, stirring occasionally, until beans are fully swelled. Add boiling water as needed to keep level just above the beans. Slowly boil for 1 hour. DO NOT COVER. At end of first hour: add bacon or ham and about 3 T. bacon drippings. Keep heat very low. Beans should cook so slowly that only a bubble oozes to the surface every second[d] or so. At end of second hour: stir in garlic and continue to cook very slowly, stirring occasionally. At end of third hour: stir in oregano and chili pequins. The oregano should be spooned into the [palm] of your hand and ground between your palms, sifting into the pot. (This will bring out all the delicate flavor of oregano.) Grind and mash chili pequins; sprinkle into beans. At end of fourth hour: add salt (1 T. per pound of beans). Beans are now ready to eat although they are better if very slowly simmered for another hour. At end of fifth hour: spoon out into bowls. Eat with spoon. If you like mushy beans, cook in artesan water. If you don’t, use Ft. Worth water or hard water. Mix all but 1 C. nuts. Shape in ball and roll in remaining nuts. Blend together well. Shape on platter as a fish. Use olive for the eye. Chill. Serve with crackers. Slice or dice zucchini and avocados. Dice onion or cut in rings. Cover the avocado with lemon juice. Add the zucchini and onions. Gently toss with the sour cream and season with salt and garlic salt. Serve as a dip or put in puffed taco shells. Drizzle over 1 3 oz. can (2 – ¼ C,) of chow mein noodles. Sprinkle with ¼ t. celery salt and dash of onion powder or garlic or onion salt. Place in jellyroll pan in very slow oven (275 F.) for 12-15 minutes or till lightly browned. Can add other ingredients: peanuts, chex cereals. Mix together. Add one fifth inexpensive light rum. Just before serving over block of ice in punch bowl, add 1 quart domestic champagne. Garnish as you wish. This can be made 1 week ahead and stored in a glass or plastic container. After brewing, pour into mugs and add rum. Day before heat oven to 325 F. Drain fruits after cutting into bite size pieces. Dry fruit on paper towels; arrange in 1 ½ qt. casserole. Melt butter and add sugar and curry powder. Spoon over fruit. Bake one hour uncovered. Let cool and then refrigerate overnight. When ready to serve reheat casserole in 350 F. oven for 30 minutes. Add 1 pkg. lemon Jello. Stir until dissolved and then let cool. Add ½ C. mayonnaise and mix in blender. Cream butter and sugar, add eggs, vanilla and beat well. Sift together dry ingredients. Add sifted ingredients and sour cream alternately. Beat well. Mix nuts, ½ C. sugar and cinnamon. Put half of batter into lightly greased 10-inch tube pan. Sprinkle half of nut mixture over top. Add rest of batter, then last of nut mixture. Bake at 350 F. for 45 minutes. Stays moist for a long time. Blend and beat as instructed on package. Grease and flour sheet cake pan or tube pan. Bake at 350 F. for about 50 minutes, or until tester comes out clean. Blend all ingredients in large bowl; beat 5 minutes. Pour into greased and floured 10” tube pan. Bake at 350 F. for 45 – 55 minutes until center springs back when touched lightly. Cool in pan about 15 minutes. Glaze: Blend well –1C. confectioners sugar, 1 T. orange juice, 1 ½ T. Galliano, 1 T. vodka. Prepare batter from 1 pkg. spice cake mix according to pkg. directions, but using 1 can condensed tomato soup plus ¼ C. water in place of liquid called for on cake mix box. Add ½ C. each seedless raisins and chopped nuts. Bake in 2 paper-lined 8” round pans at 350 F. about 30-35 minutes or until done. Cool 10 minutes before removing. Frost with a cream cheese/confectioners sugar frosting. Combine first 5 ingredients and cook in heavy skillet over low fire for about 10 minutes, stirring constantly until thick. Let cool. Then add nuts and Rice Krispies. Drop by spoonfuls into flaked coconut. Form into balls. (For smaller cookies, use a teaspoon). Cover grapefruit peel with water and add salt. Boil for 15 minutes. Pour off water and add fresh water (no more salt). Boil for 2 minutes. Again pour off water and add fresh water. Boil again for 20 minutes. Drain peel and cover with 3 C. sugar and 1 C. water. Simmer, stirring frequently until syrup boils away. Spread peel on waxed paper. Roll in sugar, or shake several pieces at a time in a coffee can, adding sugar as needed. Dry on wax paper several hours and store in covered container. Can be frozen for holiday gifts. If you like, ¼ C. brandy can be added to the final syrup. Note: Be sure to remove the white pith from the peel as it can be bitter. Place four C. of berries in a saucepan with one cup sugar and simmer gently for ten minutes. Trim the crusts from eight slices of bread; butter the bread generously and trimmed to fit, line a baking dish with it. Pour some of the warm berries and juice over the bread, and continue with alternate layers of bread and fruit, ending with fruit. Bake in moderate oven for 20 minutes. Serve with whipping cream. Can be made with raspberries or strawberries, too. Slice the top off the orange – about the size of a 50 cent piece or larger. With a sharp paring knife or a steak knife, cut out a cone-shaped center from the orange. Fill the orange rinds with slightly softened sherbert and replace top slices. Freeze firmly. The Oranges look well in rice bowls and they won’t roll so easily. Accompany them with a brownie or a bit of fresh fruit. Always makes a hit and tastes great after a heavy meal or on a summer evening. Raisins, mixed nuts and M&M’s. Every hiker needs this for energy. Dig a hole, with straight sides, 4” larger in diameter and 4” deeper than your Dutch oven. In this hole you build a fire –a big fire. Use a dense wood such as oak, pecan, hickory, gum, etc. It will take about an hour or more for the fire to render itself to coals, so towards the latter part of it prepare the vegetables by cutting them into chunks. This method requires a pre-heated oven and lid to prevent heat from being drawn out of the iron by cold ingredients, so keep them close to the fire –not too close, however. Rotate them every 5 minutes or so to prevent burning the seasoning of the oven. When the coals are read, place the oven on them and throw in a piece of suet cut from the roast. When it starts to smoke, immediately sear the meat on all sides. Remove the oven from the whole; stir up the colas a bit and remove about half of them. Place them in a pile a foot or so from the hole. Replace the oven in the hole; add vegetables and the cup of liquid seasonings. Then cover with lid. Place the remaining coals around the oven and on the lids. Then loosely cover the whole ball of wax up with 4” of dirt –honest! One or two other things: this meal will be read to “exhume” in 4 hours. However, it will be OK in the ground up to 6 or 8 hours in that it cannot overcook. As in all outdoor cooking, use coals and not an open flame. Don’t try to hurry the process – wait for a good bed of coals. Lastly – all the spices can be omitted if not handy except salt, pepper and 1 cup (no more) of water. Learn more about the history of the Dallas Architects’ Wives Club and hear more memories from its past members online here.